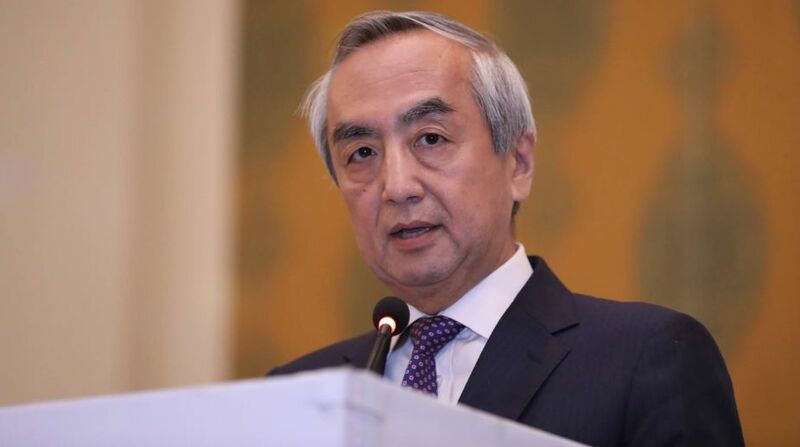 Kenji Hiramatsu, the Japanese Ambassador to India, graduated from University of Kyoto in March 1979 and joined the prestigious Foreign Ministry a month later. Born in 1956, he has served his country in various capacities both at home and abroad. He has been Japan’s envoy to India since November 2015. In this interview to Ashok Tuteja and Debdeep Mukherjee at his residence at the Japanese Embassy in New Delhi, he spoke extensively about India-Japan ties, UN reforms, and the South China Sea. What was the reason for your recent visit to Imphal? My visit was mainly to the historic site of the fierce battle of World War II to commemorate the 73rd anniversary of the Battle of Imphal and pay condolences to the soldiers who sacrificed their lives. It is estimated that 5,000 soldiers of Indian National Army, 15,000 soldiers of the British Commonwealth Force and 30,000 soldiers of the Japanese Army sacrificed their lives. The people of Manipur and Nagaland suffered greatly from these battle and aerial bombings which preceded. With me, a delegation of 30 enthusiastic Japanese businessmen of various companies based in India went on the visit. The other reason was that we want to attach ourselves with the development of Northeast. Japan stands ready to support the overall development of the region. How do you look at the current state of India-Japan relations? The relations are best in the history.There is a very strong friendship and trust between our two leaders. In the last fiscal year (2016-17), the volume of trade between the two nations stood at $ 4.7 billion, up from $ 2.6 billion in the previous year. Our relationship is expanding not only in trade but also in political and strategic areas with enhanced peopleto- people contacts. This is one of the best moments for JapanIndia relationship. India has opposed China Pakistan Economic Corridor (CPEC) on the ground that it runs through Pakistan occupied Kashmir (PoK). Do you endorse India’s stand? As a strategic partner, Japan has been discussing all issues with India, including CPEC. We have been informed about India’s position and concern with regard to CPEC. We understand and respect the position taken by India based on the principle of territorial integrity and sovereignty. India boycotted the recent OBOR Forum hosted by China to register its protest over the CPEC. Do you think India should have participated and registered its protest? It is a sovereign country’s decision. We must respect it. Why did Japan participate in the OBOR Forum? We are watching carefully China’s OBOR initiative. We are focusing on the connectivity and infrastructure projects. We participated with the hope and basic idea that this project would be open to all and based on international standards. China is Japan’s neighbour and we would like to have a constructive relationship with it. Japan’s House of Representatives recently approved the India-Japan civil nuclear deal. By when do you think Japanese Parliament will give approval and by when would it come into force? It was approved by the Lower House of Parliament on 16 May and it has been handed to the Upper House. Japan has a very rigid division of power so it is very difficult to predict when but we hope it will be passed by the Upper House as soon as possible. How do you look at the situation in South Asia with relations between India and Pakistan touching a new low? As a strategic partner, we have been watching the situation in Kashmir and ties between India and Pakistan very closely. Do you think Japan can play a role in lowering tension in the region? We have been informed by India about the situation in Kashmir. Based on that, we should have more dialogue with the Indian side to see what Japan can do to enhance connectivity in this region, especially with Sri Lanka and Bangladesh. Japan and India can collaborate in the region for stability and connectivity as strategic partners. Why do you think China is opposing India’s admission to the Nuclear Suppliers’ Group? Please ask this question to China. Our position is that we are working together closely with India on this issue and we want India to become a member of the NSG as soon as possible. How do you rate the prospects of the G-4 (India, Japan, Brazil and Germany) becoming permanent members of the UN Security Council? I have been personally a part of the G-4 business for many years. I strongly think India and Japan are entitled to be permanent members of the Security Council. We are working very hard to attract other countries to give a momentum to the reforms process. We are having discussions with African countries and we hope there will be some progress in Inter-Governmental Consultations in the current session. We hope Japan and India will become members in the very near future. Is the India-Japan-US trilateral dialogue aimed at containing China? We share the same values like rule of law, open societies, and democracy. Japan, India and the US are very important players. It is very natural for us to join hands for peace and stability. I am a firm believer of the dialogue. Why is China adopting such a rigid position on the issue of navigation in the South China Sea? Difficult to explain China’s position. Our position is very clear that the issue of the maritime domain should be in accordance with international law. We expect to resolve and settle the conflicting issues peacefully. Any action that escalates tension should be avoided. Based on these principles, we are working closely with like-minded nations like India and are raising our voices in global platforms. When is the next India-Japan annual summit? Last year Indian Prime Minister traveled to Japan. Prime Minister of Japan would come to India to attend the summit this year. Dates have not been decided yet.